Licensed by MGA, Yako Casino has been providing a great selection of games developed by the industry giants (Microgaming, Evolution, NYX...) since 2015. As a part of EveryMatrix NV group, YakoCasino has an excellent track record of satisfied consumers and games versatility – even though they are a relatively new casino on the market, the game catalogue is quite rich and includes the newest slots, live games, arcade games, keno... New players not only get to enjoy the latest and mobile device compatible releases, but also get a deposit-free, registration bonus and R3,333 welcome bonus after the first deposit. If you are always on the go, Yako Casino has an extensive offer of progressive slots, live dealer and table games that can be launched from behind the screens of your mobile devices. Regardless of the brand and the model of your phone or tablet, the players can enjoy their favourite releases wherever they are without compromising the quality. Every aspect of the overall casino experience, from the registration process to submitting your first deposit and testing a game, will remain equally user-friendly and functional on all Android, Windows and MAC phones and tablets. The list of game developers featured on YakoCasino is pretty lengthy and includes BoomingGames, Genii, Habanero, JoinGames, Lega, Microgaming, Multislot, NetEnt, NYX, 1X2Gaming, PariPlay, Play n Go, Playson, QuickSpin and Spigo. The games are grouped under Slots, Jackpots and Table Games with an additional live dealer section that contains literally dozens of different poker, roulette, baccarat and blackjack variants. Ten free spins are just a warm up for what Yako Casino has in store for their members. All one needs to do in order to use the complimentary spins is to finalize the registration process and the freebies will be immediately transferred to the player's account. The second part of YakoCasino promotional offer comes right after the first deposit. 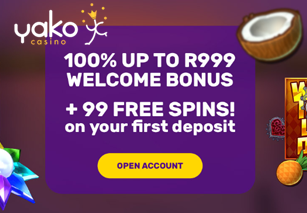 As soon as the money is transferred to YakoCasino, it will be matched with 100% bonus (up to R3,333) and 222 extra spins. Bonuses come with the wagering requirement of 35 times and the spins are valid for 72 hours. Regular players are rewarded with weekly cash-back Bling it On bonus that comes with a wagering requirement of 10 times and excludes bonus money winnings and bets. For any inquiry one may turn to Live Chat support that YakoCasino provides 24 hours, 7 days a week. Other alternatives are email and phone line active from 12.00 to 23.00 CEST. The agents are efficient and polite and the response time is measured in seconds. Yako Casino uses the following methods for deposits and withdrawals: VISA, MasterCard, Ideal, Trustly, Neteller, Entropay, Paysafecard, Entercash, Zimpler, Skrill. The withdrawal time is pretty fast if you use e-wallets, but can last 3 to 4 business days for cards and bank transfers. Minimum deposit submission for the players who want to receive a welcome bonus is R300 (regular deposit is R140) and the maximum withdrawal is around R74,000 a day on regular withdrawals and R740 for bonus withdrawals. What do We Think of Yako Casino as a Whole? Yako Casino has a lot to offer to their players when it comes to the game selection and customer accommodation. Besides the hundreds of titles available across different operative systems, South African members can enjoy both real money and fun play gaming in a safe environment and use their local currency for fast, hassle free deposits and withdrawals.